Prof. Abdul Rauf Roofi earned great affection of Pakistani Nation in a short span of time through his Naat Khuwani. 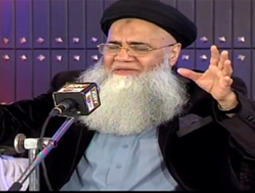 He is a famous Naat Khawan in Pakistan who owns many famous albums of Naats on his name. Prof. Abdul Roofi Naats are infused with instrumental sound effects that still contain a significant place among numerous people. He has an appealing voice as well as bundle of fans that love listening Abdul Rauf Roofi Naats. Some of his famous albums of Naats are Al-Madina Chal Madina, Ausaaf-e-Hameeda, Hum Tou Gulab Hogaye and Patti Patti Phool Phool. You can find a latest collection of Prof. Abdul Roofi Naats 2015 available online on HamariWeb for their users. You can search and listen Abdul Rauf Roofi Video Naats on our website without any trouble. You can also download Abdul Rauf Roofi Naats Mp4 format as well as compilations such as greatest hits and rare classic albums through HamariWeb.com. Get the updates of Abdul Rauf Roofi New Album through Naat Sharif section of HamariWeb.